You guys. I'm so excited about today's post because there are so many good things to talk about! First of all, Mother's Day is just around the corner, and I've teamed up with my friends at Fair Trade USA (along with some other fabulous bloggers) for a virtual Mother's Day brunch. I developed this recipe especially for the occasion, and I have to tell you, I may never bake individual cinnamon rolls ever again. My favorite part of a cinnamon roll is the soft, flaky interior, and - guess what. You get more of that when you make one giant cinnamon roll! And you can slice it like cake! I really love how all those beautiful layers separate ever-so-slightly on the plate. 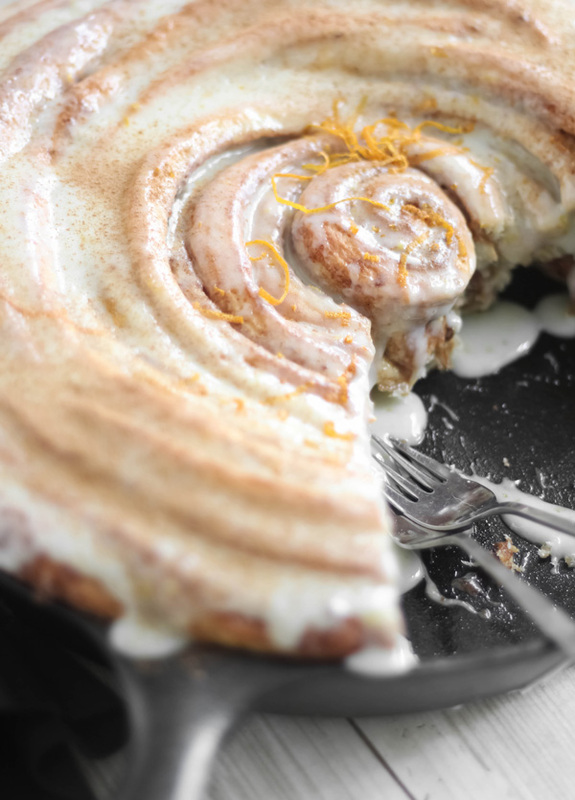 It's irresistible when smothered with orange-zested cream cheese glaze (I swoon!). Second, there's a giveaway involving some of the best stuff around - products that are really worth using! 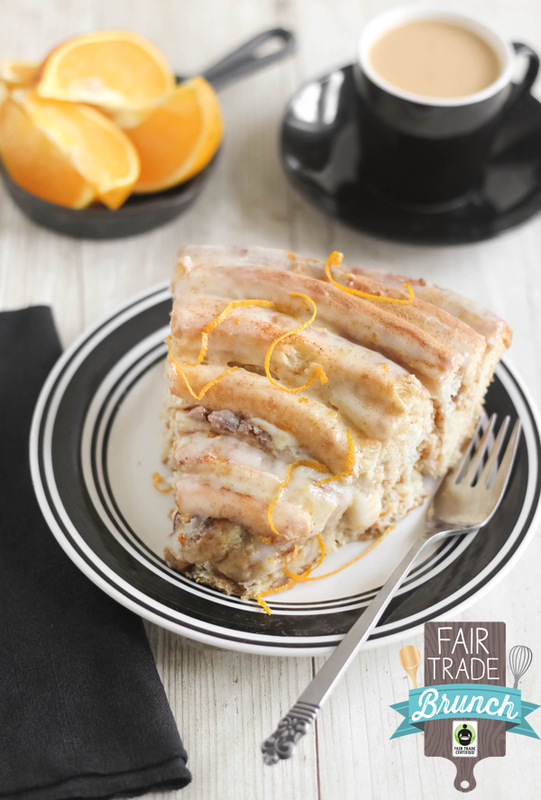 I buy Fair Trade whenever possible, not only because the products add quality to my baking, but also because it positively impacts the lives of Fair Trade workers. There are a great number of women who work for Fair Trade companies, including moms who are working to provide better lives for their families. This virtual brunch is our way of honoring them. And all moms, really! Fair Trade certified, means the products come from workers that are justly compensated. Below are some of the best teas, coffees and snacky foods I've ever tasted, and we're giving the whole stash away to one lucky winner! 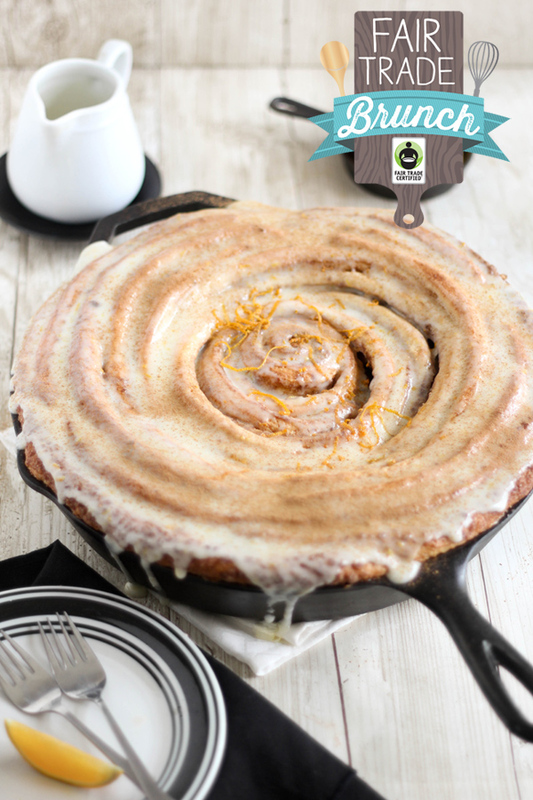 You'll get the same delicious Fair Trade cinnamon and muscovado sugar that I used in this skillet cinnamon roll. And just take a look at this Prana embroidered scarf. It's even prettier in person. There's a friendly little competition going between the participating bloggers, too. So you can help me out by re-pinning my image here! 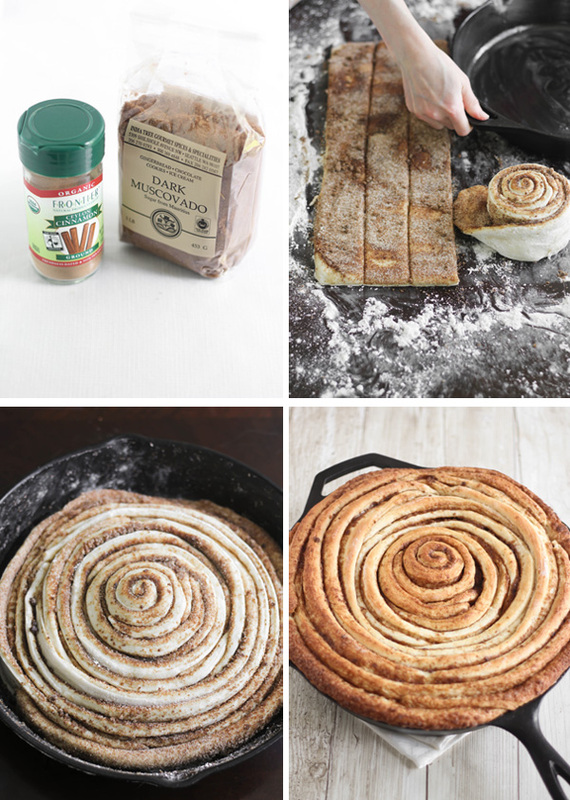 Now to even more good stuff - step-by-step instructions for the skillet cinnamon roll. You'll see my process below, and I hope it will serve as a helpful guide while you make your own! The entire process is a little messy, but well worth the end result. The muscovado sugar really punches up the brown sugar flavor, so it's worth seeking out next time you're at the grocery store. Just look at that landscape of swirly goodness up there. I can't wait to try out different versions of this skillet pastry. Maybe I'll hide some Guittard Fair Trade chocolate between the layers next time. For the dough, heat milk, 1/2 cup sugar and salt in a saucepan over medium-high heat. Stir until sugar melts and a few small bubbles appear at the edges of the pan. Remove from heat and let cool while you prepare the other elements. Dissolve yeast and 1 teaspoon sugar in very warm water (90°F to 110°F) in the bowl of a standing mixer (or a large bowl if you don't have a stand mixer). Stir with the paddle attachment (or wooden spoon) until well blended. Let stand 10 minutes. Beat eggs into yeast mixture. Stir in cooled milk mixture (it should be lukewarm), switch to the dough hook then add in flour a little at a time until dough is elastic. Add melted butter and mix, then add in more flour until dough is elastic and pulls away from the sides of the mixer. Note: you may not have to use all the flour. Do not add so much flour that the dough does not stick to your hands. Set a timer and knead with the dough hook (or knead with hands on a floured surface) for 5 minutes. Place dough in a buttered bowl and turn it over to coat the entire surface. Cover with plastic wrap and let rise in a warm place 1 hour or until doubled (mine took a little longer than an hour to double). 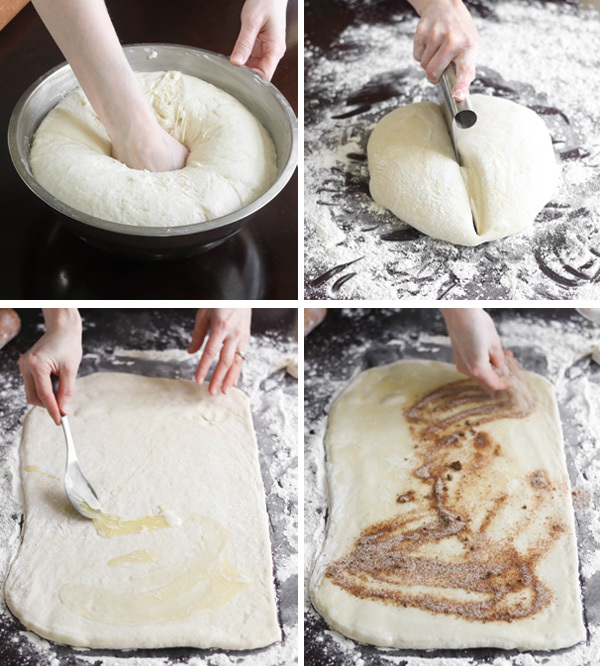 Punch down dough and turnout onto a lightly floured surface. Knead a few times and cut into two pieces. Roll out each piece to 12x9-inch rectangles. For the filling, brush the rolled dough pieces with the melted butter. Sprinkle each with half the cinnamon sugar mixture. Cut the each dough piece into 5 even strip lengthwise. 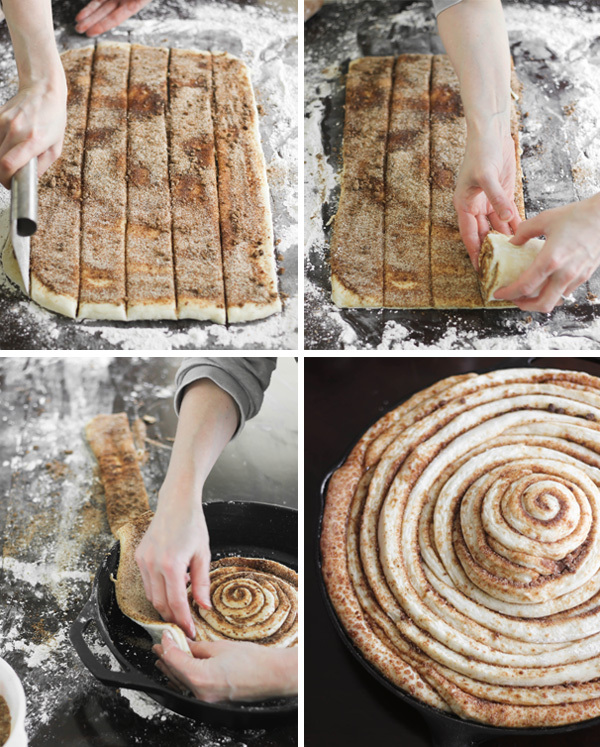 Roll one strip up as if you were making a regular cinnamon roll. When you get to the end, use another strip and continue rolling. When the dough spiral reaches about 6-inches in diameter, (3-4 strips-worth of spiraling) place it in the center of a lightly greased 12-inch cast-iron skillet. Continue spiraling dough strips around the middle. This is a messy job, but just embrace the mess. It'll be well worth the end result. When all the dough has been used, cover and let rise about 45 minutes or until doubled. Whisk together glaze ingredients, adding additional milk as needed. Glaze pastry in the pan while it is still hot. Add additional orange zest if desired. Slice into pieces and serve while still warm. Allegro Coffee, Guittard, Nutiva, BarkThins, prAna, sweetriot, Numi Organic Tea, Frontier Natural Products, Choice Organic Teas, India Tree, Honest Tea. My last trip yielded a giant tub of candy necklaces and an extra large package of strawberry-stripe marshmallows called Puffy Poles. The two looked so pretty when I held them together, I felt certain that they would live harmoniously on a candy-inspired cake. I already had a clear image of what I wanted the cake to look like, so it was just a matter of choosing a cake flavor and putting it all together. The Puffy Poles are really soft and delicious with a pronounced strawberry flavor, and I didn't want to take away from that. 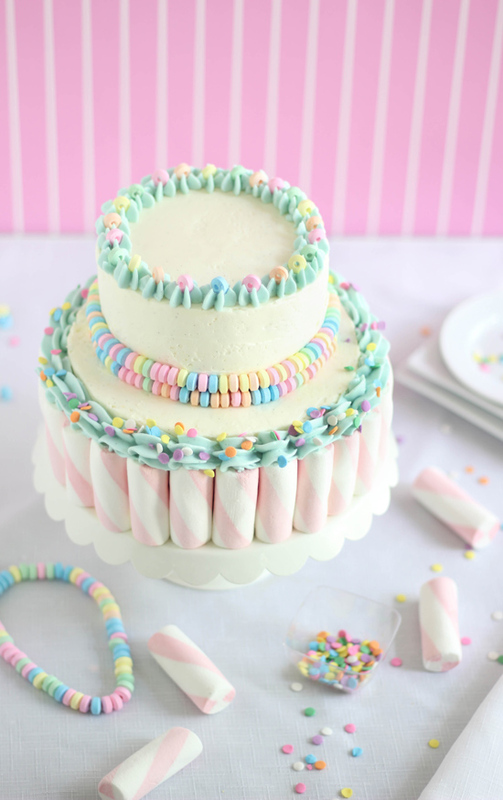 I ended up making a simple white cake swirled with pastel color. The frosting is Swiss meringue buttercream - it had to be. 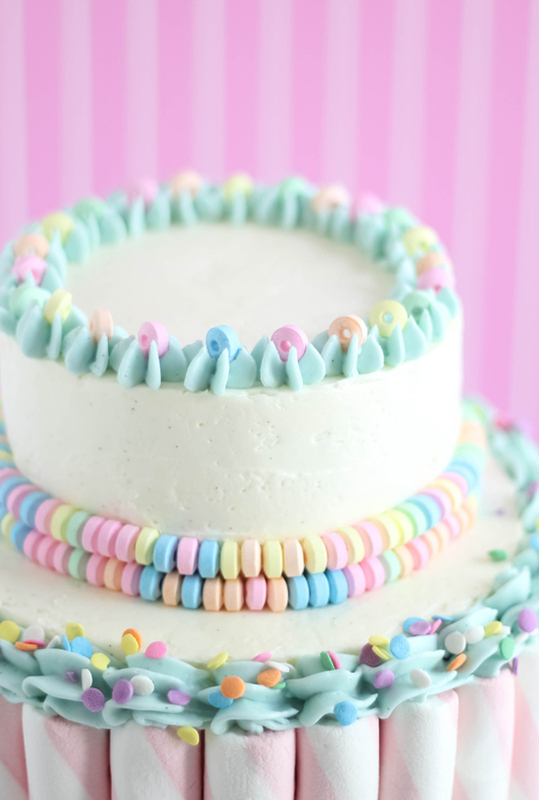 It doesn't crust like American buttercream frosting, so you can take your time applying the candies and marshmallows to the sides of the cake. Hi friends! Today I'm doing something a little different. 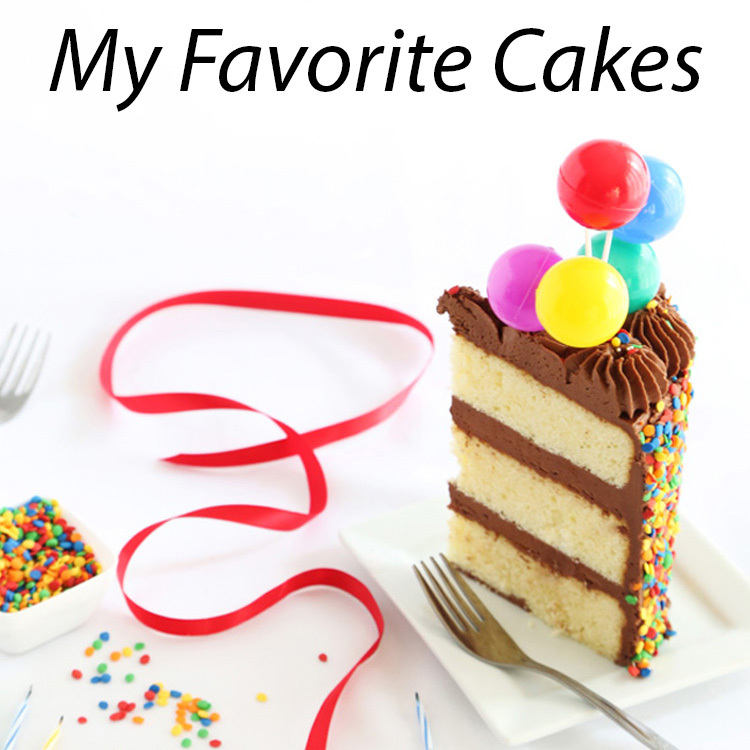 I'm going to show you a few of my favorite piping techniques for cupcakes. I even made a fun video tutorial, and if you're an email subscriber then you'll need to click here to view it. If you're visiting the blog, then you can just scroll down to the embedded video. These techniques are perfect for beginners because they are so forgiving. How forgiving? Well, in the video my frosting begins to soften considerably under the studio lighting, but even then things turn out beautifully! If you're a seasoned decorator you'll probably already know these techniques, so be aware this video is geared more toward novice decorators. Beginners will need a few supplies to get started. First, good thick buttercream frosting. 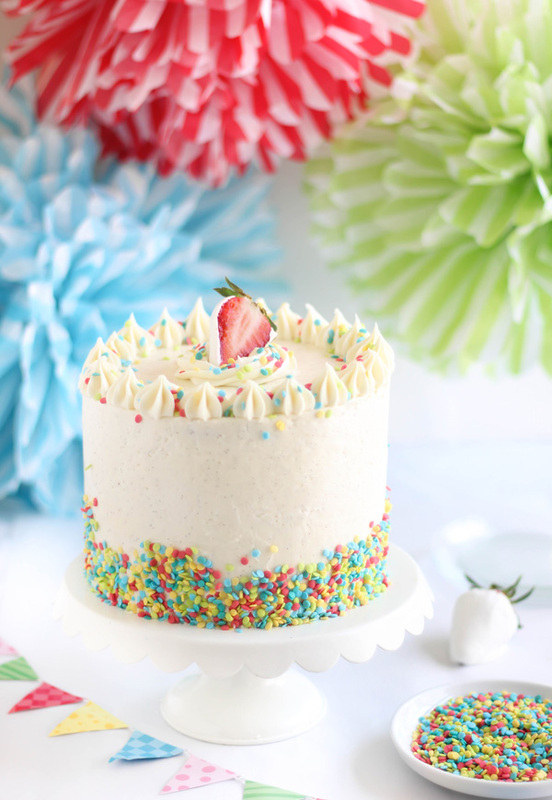 You'll find my two favorite frosting recipes at the end of this post. You'll also need the decorator piping tips featured in the video so I've linked them below. Piping bags are a must! Reusable or disposable - your choice, because either will work. In the video you may notice that I don't use couplers, and instead I just drop the piping tips into the bags, score the end of the bag and get straight to piping. I honestly feel the couplers are not necessary when using larger tips, but I do use them for smaller tips and when I need to quickly switch out a plain tip for a star tip. 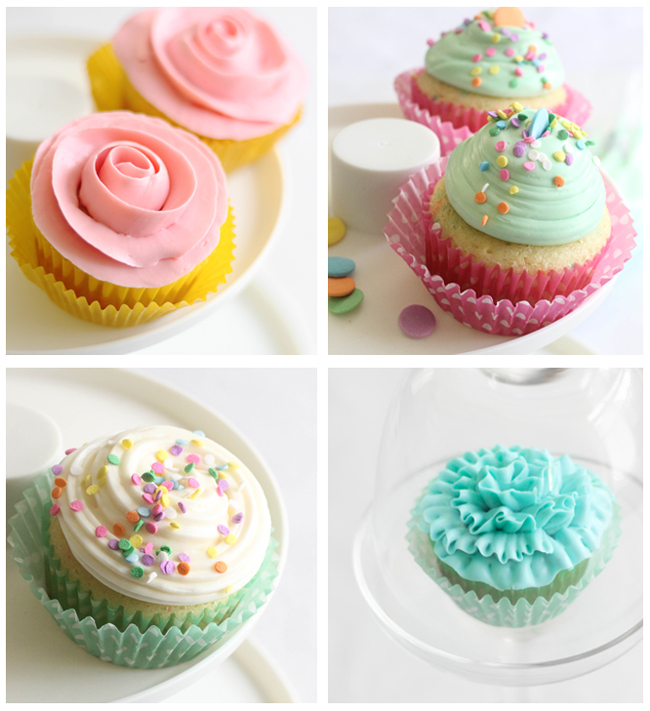 My favorite decorator piping tips! Ateco Pastry Tube Star Size 8 - This is the first tip demonstrated in the video. It may be my very favorite piping tip of all because you can make the perfect soft serve ice cream swirl on top of a cupcake. If you've never ventured into piping, then this is a good one to consider buying first. I also demonstrate a single swirl with this tip, and you may remember it from these lucky vanilla cupcakes. Wilton Petal Decorating Tip 125 - This is the second tip demonstrated in the video. It's a petal tip, which certainly makes pretty individual petals, but I love using it for piping a simple rose in one continuous icing spiral. 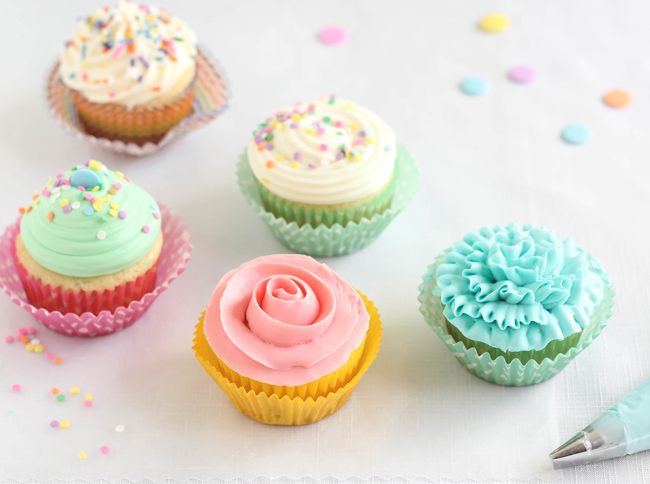 This technique takes a little dexterity, so it's a good idea to set aside one or two practice cupcakes. Wilton Decorating Petal Icing Tip #104 - or, ruffle tip. This is the third tip demonstrated in the video, and you can see that it's just a little smaller than the previous petal tip. In my opinion, it's the best size petal tip for ruffling cupcakes. When I first tried this technique I felt like I was making a real mess of things - starting and stopping rows, accidentally smearing a few ruffles with the piping tip - but when I finished, the cupcake looked picture-perfect. So remember, if you get halfway through ruffling and things are feeling a bit chaotic, keep at it and judge the end result. This petal tip can also make daisies, like the ones on these cupcakes I made for the Etsy blog last year. Ateco Pastry Tube Plain 808 - Icing mounds are the easiest of the easy-to-make. Honestly, you don't really even have to use a piping tip to achieve the effect. You could just use a zip-top bag with the corner snipped. That said, I really like this size piping tip to make a nice fat, even heap of frosting on top of cupcakes. It's the tip I use for these champagne cupcakes, too. Ateco Closed Star Pastry Tube 847 and 843 - I love to use these two piping tips together, as you can see demonstrated on the last cupcake in the video. 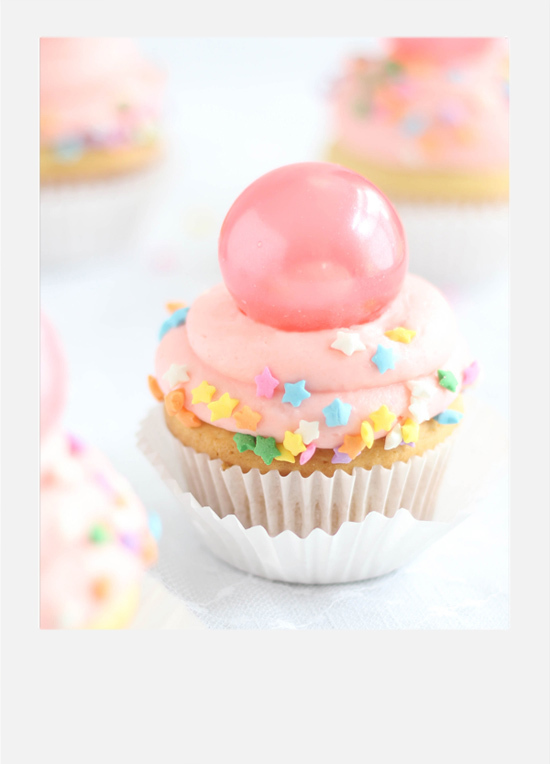 The smaller one is used to make little stars around the edge of the cupcake and the larger tip makes a nice big swirl in the middle. It looks best when contrasting colors are used, like these bonbon cupcakes I made for Valentine's day. Let's not take things too seriously today. 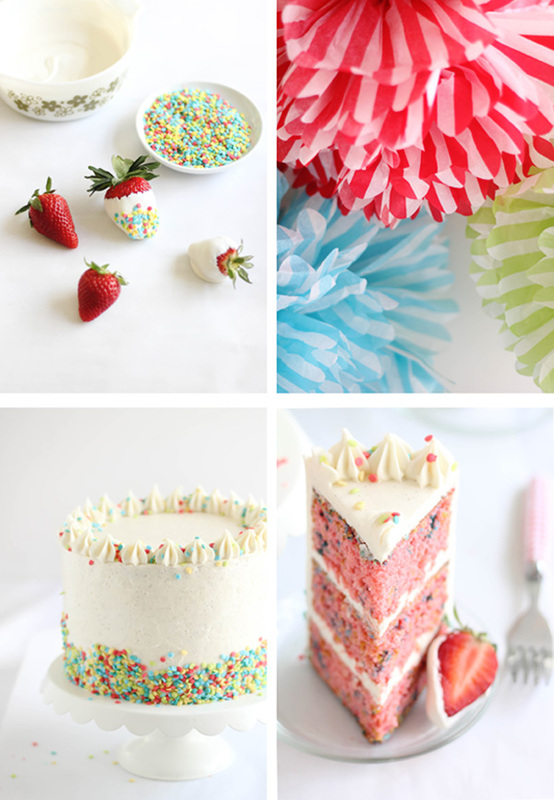 Instead, let's make cupcakes with bubble gum frosting and use way too many sprinkles. 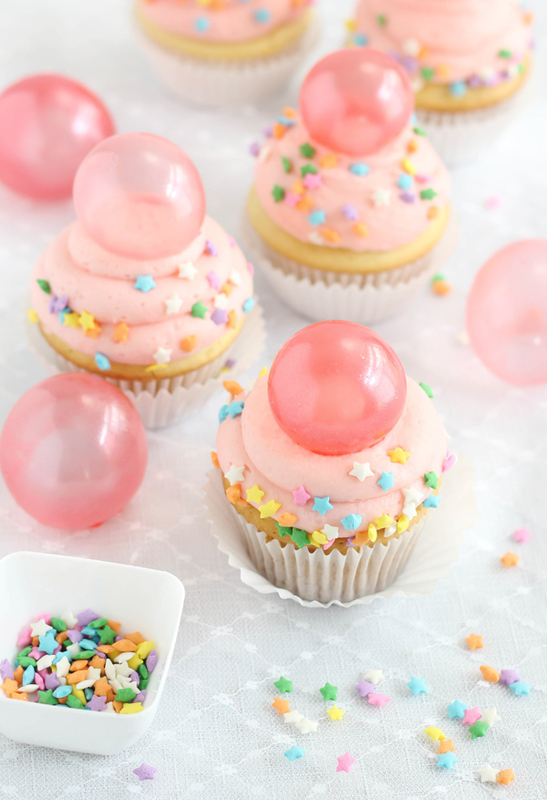 Let's be crafty and make gelatin bubble toppers, too. It's easy and I'll show you how! I first saw the gelatin bubble technique weeks ago on Cake Central, and I've been dying to try it ever since. 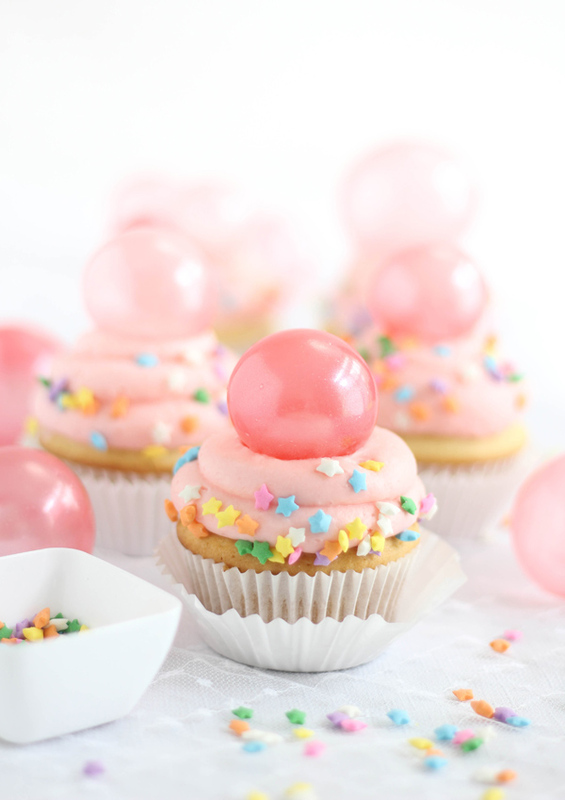 I wasn't sure exactly what kind of treat I would make to put bubbles on - something soap themed seemed a little unappetizing, but I found my inspiration in a little dram bottle of LorAnn bubble gum flavor. In my experience, bubble gum flavored treats are a bit polarizing. I'll admit that I was wary of adding the flavor to frosting, but it's surprisingly good! Ready to see how I made the bubbles? This may be the happiest-looking bread I've ever made. Sprinkles on bread? Yes times one million! 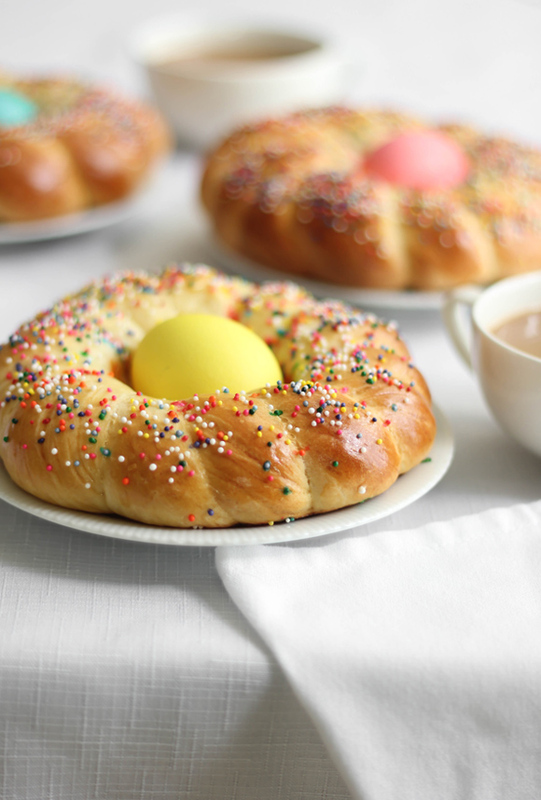 I've had Italian Easter Bread on my bake list for ages, but each year the holiday seems to pass by too quickly, or I just plain forgot about it. So, late this past Monday night, I decided to drop everything and just make it already! Because of my late start I was babysitting rising bread until 11 pm, and then rolling it into loaves at 11:30, but it was all worth it because at midnight we were pulling apart hot, feathery bread with our fingers. I've always thought that dessert tastes better after midnight. It feels like you're doing something secretive or getting away with something. The same goes for freshly baked bread. I mean, Italian Easter Bread makes a nice brunch, but after midnight it tastes AMAZING. Trust me, I would never lie about something so important. 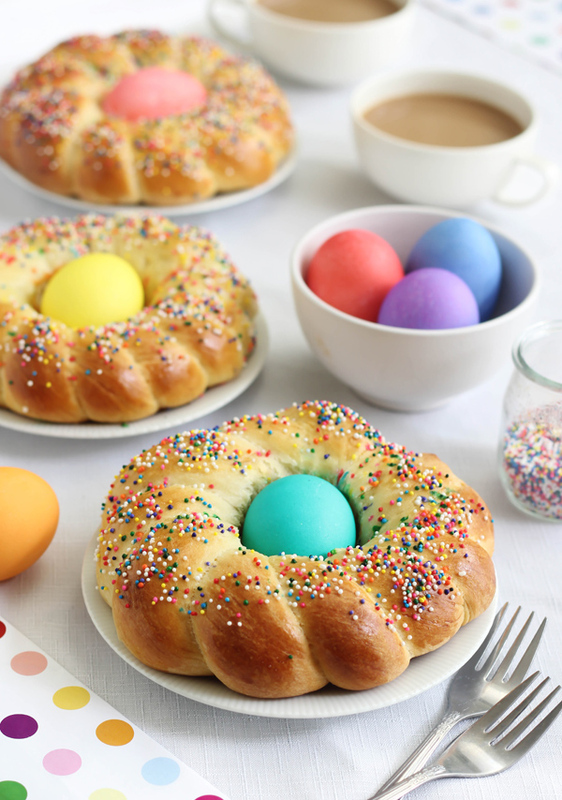 My favorite thing about this bread, besides the sprinkles of course, is the colorful egg in the center. You don't have to worry about hard boiling the eggs before adding them to the bread. They cook perfectly as the bread bakes in the oven! 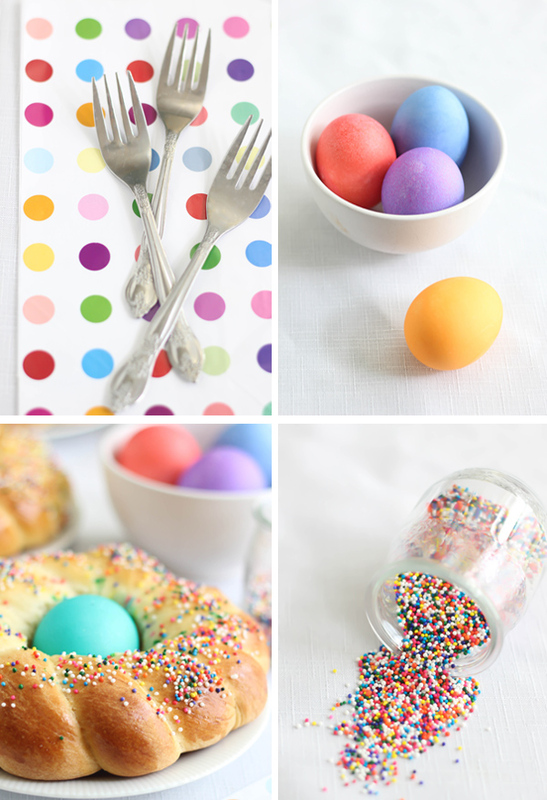 I used a common drugstore brand of egg coloring to dye uncooked eggs and allowed them to dry completely on paper towels before placing them inside the dough rounds. Most loaves turned out perfect, but the eggs in two loaves speckled a little during baking, so we ate those imperfect ones first. Just a heads up that you might experience the same result. As much as I love shiny new cookbooks (and oh, I do!) my shelf of mid-century cookbooks is my sentimental favorite. I especially love those purchased second-hand with notes and recipe clippings tucked in the pages. 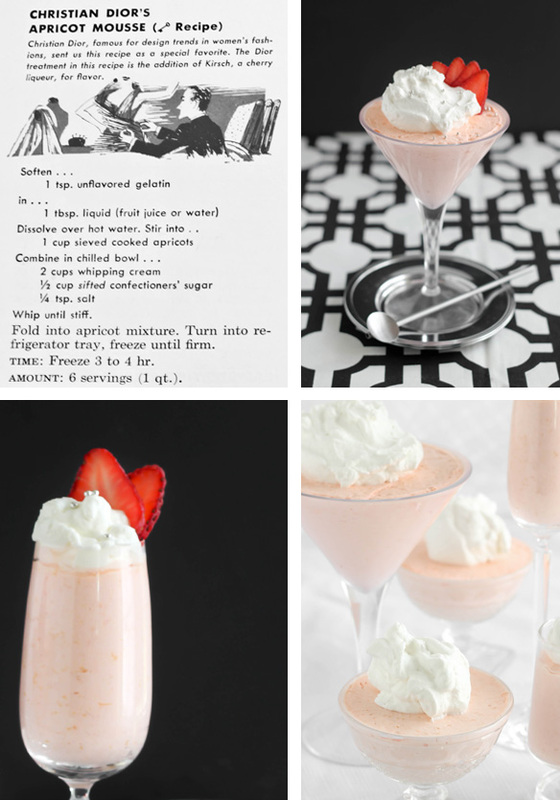 I’ll admit, reading through the oddball "Tuna Surprise" and congealed salad recipes is a weird form of entertainment for me, but there are other recipes in those pages that are still relevant today. In 1956 General Mills published the second edition of the Betty Crocker Picture Cook Book. In this revised and enlarged version, special menus and recipes were included from celebrities of the time - Jimmy Durante, Ed Sullivan and Eleanor Roosevelt to name a few. Among those esteemed contributors was French fashion designer Christian Dior. His suggested menu for "Dinner in Paris" included apricot mousse for dessert. 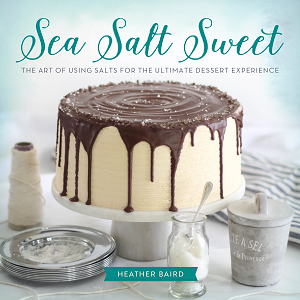 I have a copy of this book, and when I read the recipe's simple ingredients and preparation, it struck me that it would be at home in the pages of any newly published cookbook today. One might say it is as timeless as his design. 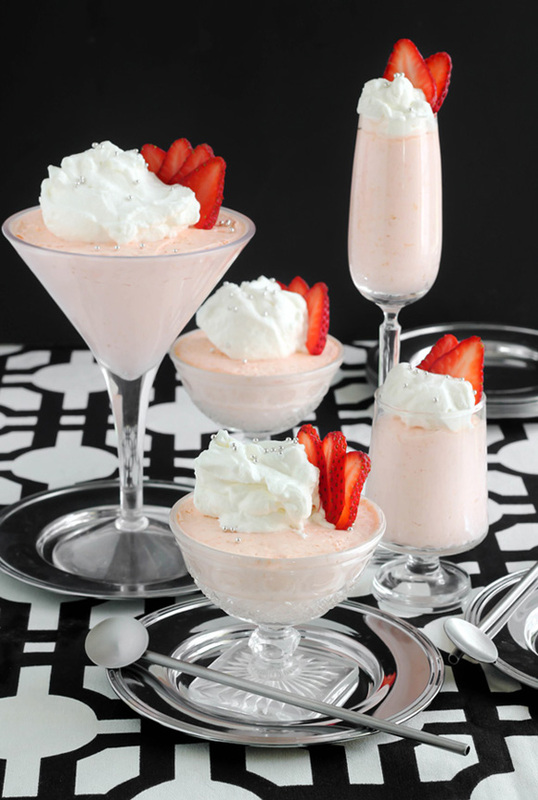 The original recipe calls for the mousse to be frozen, but I like it just fine chilled in the refrigerator. It's light and refreshing - not at all heavy - and "the Dior treatment" as it is referred to in the text, is the addition of Kirsch cherry liqueur. 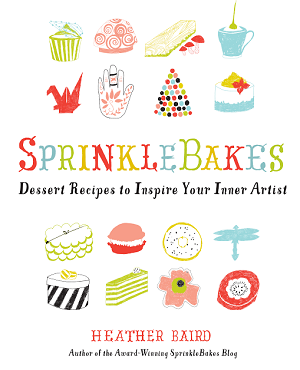 In that case, the Sprinkle Bakes treatment (heh) would be the addition of whipped cream and fresh berries. Apricots aren't quite in season here, so I reluctantly used frozen. The mousse turned out delicious and fruity nonetheless, but you can bet that I'll be making this again in summer when apricots are at their peak. I'd almost forgotten how much I loved baking choux - the way they magically puff in the oven and create the perfect hiding place for rich filling. My recent obsession with them started when I made these fancy stacked Courtesan au Chocolat. I've been making successive batches ever since, and filling them with whatever yummy ingredient is close to hand. 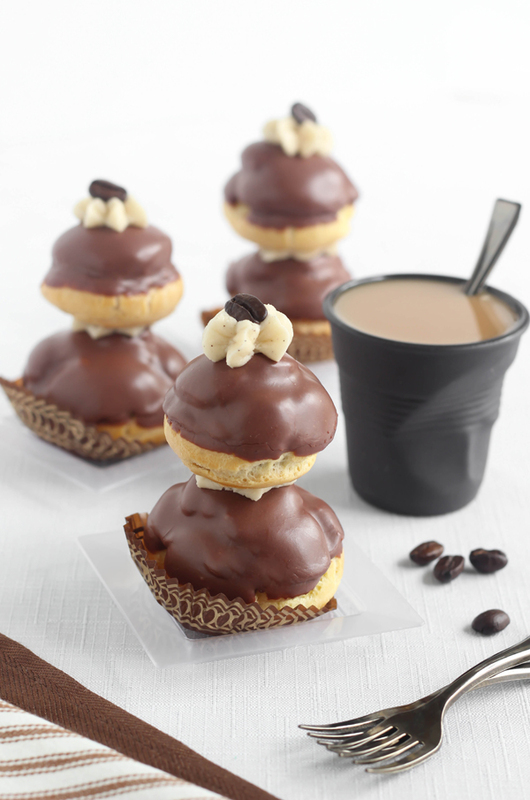 After tasting these espresso-chocolate Religieuse, I knew it was a recipe to share. It's become one of my favorite choux incarnations. Did you know that by stacking a smaller cream puff on top of a larger cream puff you create a new dessert with a fancy new name? Truly. It's a French pastry called Religieuse, and you can read more about it here. The name means "nun", given because they are said to resemble nuns in their habits (if I squint my eyes I think I can see it). The puffs are held together with dollops of buttercream - all the better when it's coffee buttercream, I say. 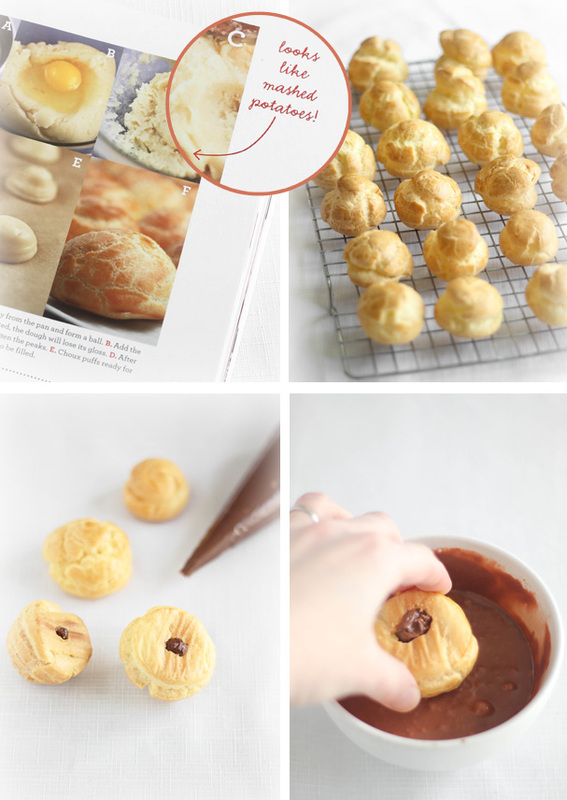 The choux recipe I use and recommend is from the SprinkleBakes book (that's it in the upper left corner picture). It never fails me. I learned how to make choux paste by hand (without a mixer) from my days as a Daring Baker, and it's still my preferred method. Yes, you can make it on a stand mixer, and it is less work, but I like the experience of working without modern gadgets when it comes to this pastry. I like that it's just me, a wooden spoon and a mixing bowl. Now, there are endless ways to make this stacked pastry look fancy. I've seen them macaron-topped, with frilled frostings, ruffles and dragees - but something about this coffee version begged for simplicity. I didn't do much more than add a buttercream star and a roasted coffee bean on top. I have two sweet things for you today! 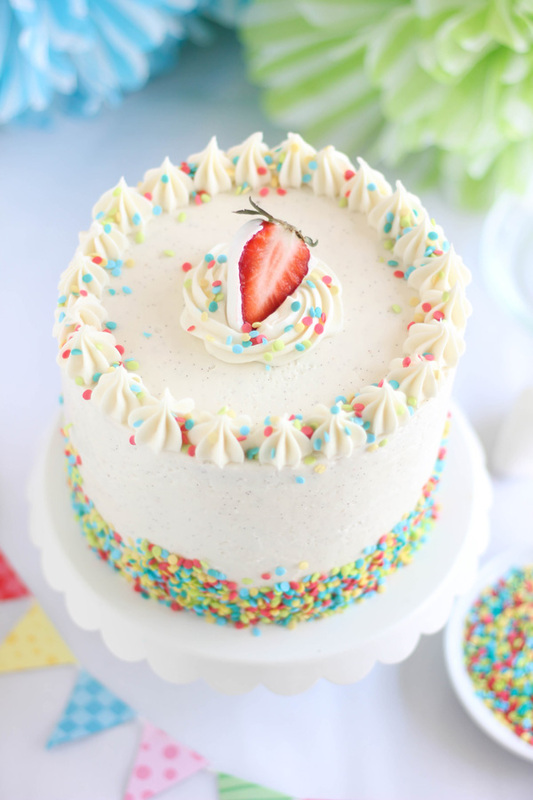 The first is this thoroughly sprinkled strawberry cake. 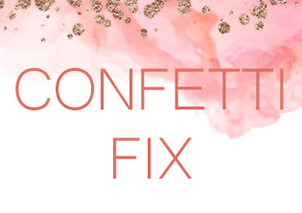 You probably know by now that my heart beats for confetti cakes, and if you're not convinced, I urge you to look here, here, here and here. This strawberry version may be my favorite yet! The second and possibly sweetest of the two is a generous giveaway from Vanilla from Tahiti! 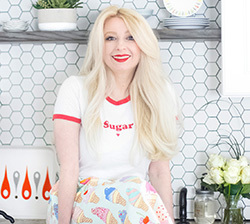 I mean, what would our baked goods be if not for the loving touch of vanilla? It's a necessity! And it's the star ingredient in the Swiss meringue buttercream on this cake. Tahitian vanilla is known to be of the highest quality, and it's used by the finest pastry chefs and chocolatiers in the world. I love using it in my baking, and you will too. 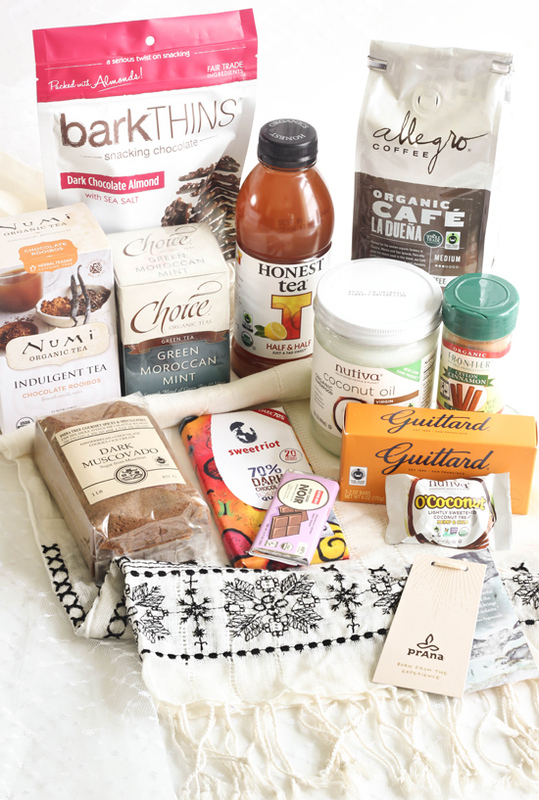 The perfect collection of Tahitian vanilla goodies to surprise and delight any epicurean. This sampler is a convenient way to experience pure Tahitian vanilla, in it's most popular forms. Perfect for the home chef. 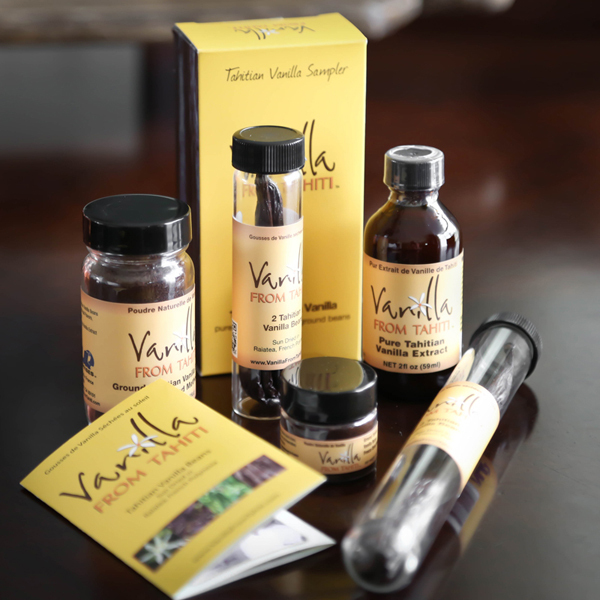 Vanilla from Tahiti is giving my readers a 10% discount on all orders! To access the discount, click here. I have to say, the Tahitian vanilla beans they sent me to sample are some of the fattest, oiliest, most fragrant beans I've ever tried. They really made the frosting on this cake something special. Just having the split vanilla beans on the counter top made the entire kitchen smell dreamy. Another product that I loved was the vanilla bean powder. I used just a smidgen in my morning coffee, and now I'm hooked! I can't wait to use it in pie crusts and cookies.